Always wash my face AM and PM, removes any dirt and oils that may be sitting on my skin, that includes cleanse, tone and moisturise. Wear SPF ALWAYS even when its cloudy, as the sun's rays are still pounding down on our skin. The sun preamaturly ages our skin so make sure you protect it. Make sure your sun screen protects both from UVB, which causes sunburn and UVA, which can penetrate more deeply causing wrinkles! Moisturise Am and Pm protects from the sun, ageing and keeps my skin supple. I change my pillow case 3 times a week and I turn my pillow around once I've slept on one side. I found that because of my hair, my skin is more likely to have a break out because of the oil and dirt on the pillow case. If you have problem skin you should give it a try. Use an eye cream, the skin around our eyes is thin so better keep it supply and show it some TLC. My nan swears by vaseline around her eyes, she's in her 80's and looks fabulous. Give myself a facial at home. I love doing this once a week, I pamper myself with a cleanse, tone, steam, extraction, mask, facial massage and moisturise. Love this, its an instant pick me up and makes my skin feel really clean. I'd recommend doing a steam once a week as over steaming can dry out your skin and exfoliate once a week works for most, thats enough to slough away all the dead skin cells and refresh your complexion. Sleep with make-up on. The thought really scares me! Don't get me wrong I used to when I was younger (early teens). I could never do it now. It ages you so early, causes, spots, and a number of other (SCARY) things. Pick your skin. I know we are all guilty of this but we can make spots worse by spreading bacteria and scarring our skin. Its mind over matter I try to put tea tree oil on it and leave it. Always include your neck and chest. This is one of the areas that shows ageing too, so when you moisturise and cleanse always include that area too and always in an upward motion. 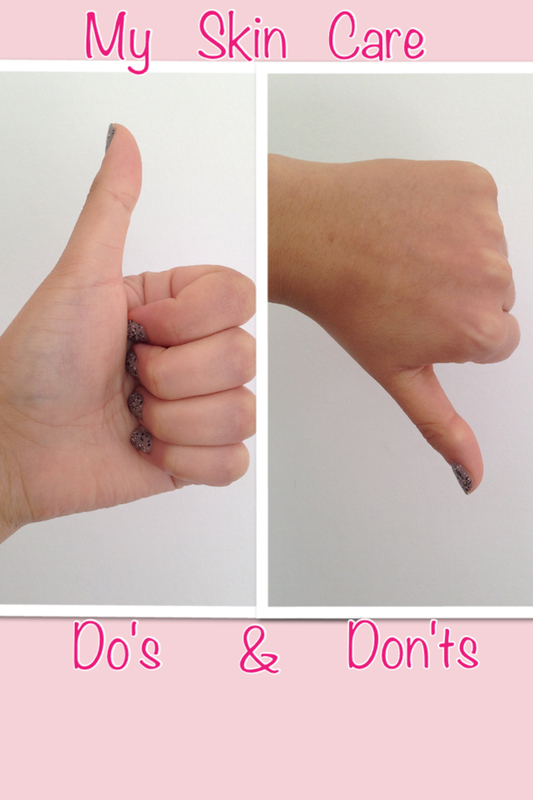 Hope you enjoyed this quick read, what are your skin Do's and Don'ts? I noticed how some people remove their make-up so roughly.I do it quite slow and gentle.Extra skin pulling can cause wrinkles. Thank you so much. Yes bloglovin in good. 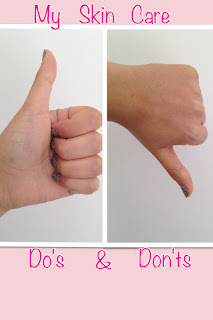 I pretty much have the same do's and don'ts! I can't ever go to bed without gathering all my hair at the top of my head in a bun first - I find it stops me breaking out from anything in my hair! Ahhh how sweet of you *blush blush*. Thank you gorgeous. Yes thats really funny you should mention the hair bun, last night as I was getting into bed I was whipping my hair into a bun and thought, oh no so should have mentioned that in my Do's and Don'ts! I always do it ..... except if I have a lovely blow dry I tend to throw all my hair back over my pillow, but out so I don't ruin the blow dry ... haha, awkward sleep! I pretty much do all the do's :) I will have to start using Vaseline though, never heard of using it around the eyes, great tip! !